"Coming from LucasArts we have so many people here that love Star Wars and have worked with the license so that would be a great fit and very cool," says Telltale co-founder Dan Connors. "In addition we will be working on a few licenses that definitely fall into our dream IP scenario and we can't wait to announce those!" Not that Telltale's odds of working on a Star Wars title are that great; EA holds the license, and may be thinking more AAA than Telltale low-key. But a Telltale co-founder can dream, and besides, there's plenty for Telltale to be happy about right now. Including that mysterious new IP. "I think we're trying to establish a vocabulary and tone for a Telltale game," says Kevin Bruner, who remembers the Infocom text adventure days with great fondness. He thinks of a Telltale title as more of a role playing game than a choose your own adventure. "It's always been our philosophy to make choices feel important as opposed to being merely mechanically important," says he. Season Two's on its way, and you'll be stepping into Clementine's very small shoes. 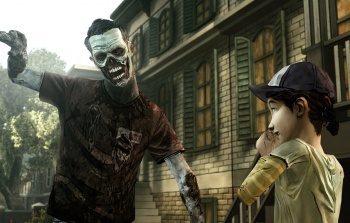 It wasn't the only way Telltale could have taken the series, and it thought long and hard before making its decision. "We were really considerate that we don't want to ruin your impression of Clem," says Bruner, "but I think we've found a really great way to make it all work." The opening episode of Season Two's due very soon, for iOS, PS Vita, Xbox 360, PS3, Mac and PC.